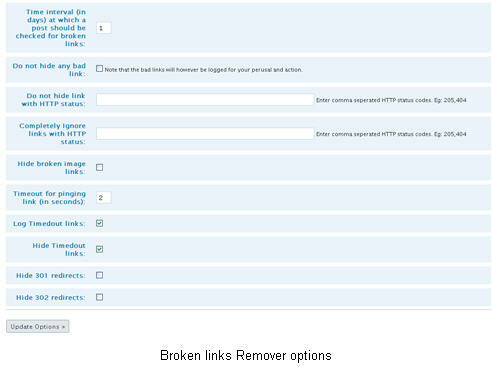 Broken links Remover plugin has a newer version – 1.2 and you are going to love this version.This version of Broken links Remover plugin provides a variety of options and you would definitely need a detailed FAQ. Here it goes. What does removal of broken links mean? Broken links remover plugin removes (hides) the display of broken links from the visitors (either human visitor or a bot).But they remain intact in your post/page, as saved in your database. Does Broken links remover plugin automatically correct the broken/bad links? No, Broken links remover plugin does not correct them.They are listed in your management panel for your perusal and corrective action. This option lets you set the Time interval (in days) at which a post/page should be checked for broken links. When a post/page is visited by a user (either human visitor or a bot), all links on the post/page are verified for their HTTP status.If one or more of them are broken/bad, they are logged (for your perusal and action).This post/page will again be verfied for broken links only after the expiry of this time interval.However, note that the post/page need to be visited by someone (either human visitor or a bot), for its links to be verified, upon the expiry of this time interval. What happens until the expiry of this time interval? On checking this option, all bad/broken link on your posts/pages will not be removed (hidden) from the display (for all the visitors including bots). All image links and text links with status 301 and 302 are not removed (hidden) by default. You can check these options, if you want to hide broken image links, hide 301 (permanently redirected links) or 302 (temporarily redirected links) on your posts/pages. However these links will be logged for your perusal and corrective action.You can see them on your management panel. This option lets you set the timeout for pinging any link.If Broken links Remover plugin cannot detect any link’s status within this timeout period, it will treat the link as timedout.Default for this option is set as 2 seconds.It is however recommended to not set this beyond 30 seconds. You can avoid logging timedout links by turning off this option.If you turn this off, all timedout links will not be available in your management panel.This option is however turned on by default. Also note that links that have timed out will show custom status (http status) of 333 or 999 in your management panel. All links that have timedout are not removed (hidden) by default. You can check this option if you want to hide timedout links on your posts/pages.Note that this option is turned off by default. This option lets you specify a comma seperated list of HTTP status codes for which you do not want to remove(hide) the links. However note that these links will be logged and be available on your management panel.Also note that links with 301 and 302 status will not be hidden by default unless you choose them to hide by selecting the options described above. This option lets you specify a comma seperated list of HTTP status codes for which you want to completely ignore the links i.e. neither hide nor log links with these HTTP status codes. This effectively means that Broken links remover plugin will not have any effect on these links and they will remain as it is on your post/page. They would not be available in the management panel for your perusal and corrective action. Should the links be retained in the management panel after I had taken corrective action? No, not necessary.Infact it would be better to clean up these links.You can clean them by selecting and deleting them in your management panel. Is it possible to directly navigate to the post/page, from the management panel, for corecting the bad/broken links? yes, it is possible.Just click on the Post ID and you will be taken to the post for correcting the reported bad/broken link. To download this version, go to Broken links Remover Plugin’s wordpress repository, download, install and enjoy a newer greater broken links remover experience. Upgraded to 1.2 without any problems. What is the best and quickest way to clear the plugins log? Can I just go into phpmyadmin and clear the tables? Or do you have a recommended procedure? Nice upgrade – thank you! Adds some great functionality which I am finding useful, especially the page numbering and ability to go to the next/previous page in the logs. Make the links on the management page clickable so it’s easy to find out if an error has resolved itself. At the moment the only way is to edit the post, highlight the link, and open it in a new tab. That’s slow! Link to http://www.w3.org/Protocols/rfc2616/rfc2616-sec10.html somewhere so users can look up what some of the more unusual return codes mean – I got a 503 today! I think all the return codes indicating temporary problems should NOT be hidden by default. As well as 302 that means 307, 408, 503, and 504 according to my reading of the above list. I might have missed some of course. I’d like to be able to ignore/hide errors by URL and by protocol as well as by return code. All “mailto:” links return 302s, for example, and links to certain pages always return 302s also. I don’t want to hide *all* 302s but I’d like to be able to hide say “apple.com/*” and “mailto:*” and “technorati.com/*” from the logs. There is an option in the managementpanel to select everything and delete.So, once you have corrected all the errors reported in a page, you could select all and delete them.But every page reports only 15 errors and the rest spill over to the subsequent pages. You could even do a delete by using SQL (via phpmyadmin).But it is up to you to make sure that you have corrected the errors, before executing a Delete SQL statement. Yes that one is feasible.Have noted it down. think all the return codes indicating temporary problems should NOT be hidden by default. As well as 302 that means 307, 408, 503, and 504 according to my reading of the above list. I might have missed some of course. I cleared out the Broken Links using mysql before fixing those broken links. I then re-installed your plugin but now broken links are not showing. I think that I’ve answered my own question by reading your doco. Have set the time interval to 1 day and suspect that broken links will once again show up in about 24 hours. I’m curious as to how your plugin is able to remember how long it’s been (in days) since checking even after uninstalling/re-installing the plugin. Anyway, don’t worry.If those posts are visited by someone (including you/or a search engine spider), all the bad/broken links will get logged again. But if they have already been visited, then you will have to wait until the time interval that you set via the first option.On the expiry of such time interval, if someone visits the same post, the bad/broken links will be logged.Also note that if you want it to be logged asap then make this time interval as 1 day(not earlier than that) temporarily.You can change it back to any other interval greater than 1.note that the default is 10 days. although I chose to completely ignore links with HTTP status 301,302 – I still get those added to the log. Am I doing something wrong?